West Africa, also called Western Africa and the West of Africa, is the westernmost subregion of Africa. 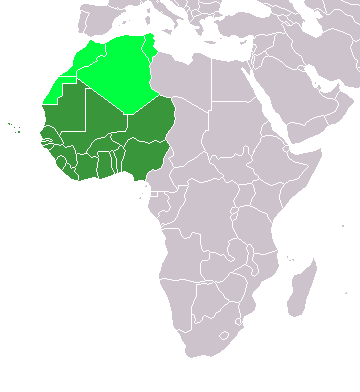 West Africa has been defined as including 18 countries: Benin, Burkina Faso, the island nation of Cape Verde, Gambia, Ghana, Guinea, Guinea-Bissau, Ivory Coast, Liberia, Mali, Mauritania, Niger, Nigeria, the island of Saint Helena, Senegal, Sierra Leone, São Tomé and Príncipe and Togo. The population of West Africa is estimated at over 349 million people as of 2015. Islam is the predominant religion of 70% of the population, with smaller amounts practicing Christianity and Traditional African religions.